If you have aging parents or grandparents that live alone, you may be concerned about their welfare when you aren’t available. This is a common concern for everyone as they get older because the body does begin to fail after years of wear and tear, or simply due to illness or other unforeseen circumstances. Falling is a very real fear for elderly parents or grandparents. When accidents occur in the home, it often leads to costly medical bills and hospital stays, not to mention psychological trauma. However, a reliable medical alert system can ensure that help is just a button push away. If you want to rest easy knowing your loved ones can get help when they need it when they need it most, Bay Medical Alert systems might just be what you've been looking for. Founded in 1946, Bay Alarm Medical has over 70 years of experience in the field of medical alert systems. This company understands that...as people get older...it often becomes harder to maintain independence. Precautions often need to be taken in order to protect the safety and security of loved ones. The In-Home System is Bay Alarm’s most popular package and includes a base station and help button. The base station has 32 hours of battery backup in case the power is ever interrupted. If you don't have a phone line, the In-Home package comes with a cellular unit specifically designed for residents without a landline. It has a pre-installed 3G SIM card from AT&T Cellular. The base station comes standard with a high-output speaker and microphone that facilitates two-way communication in the event of an emergency. In addition, the system can be used to answer a phone call via landline so that you never have to run to answer the phone again. 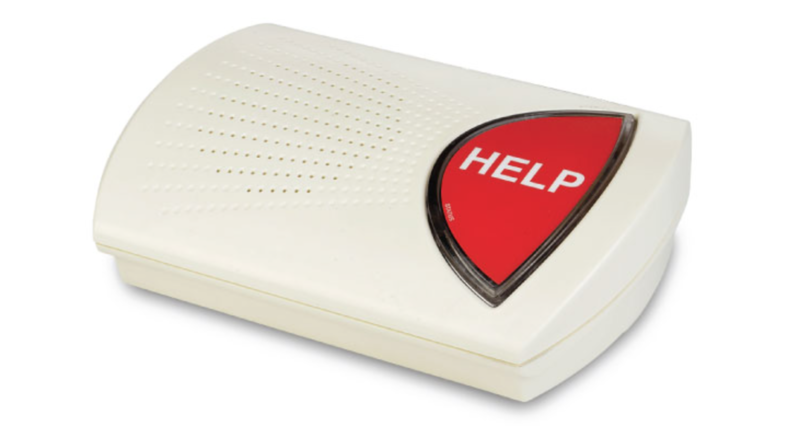 The help button can be used up to 1,000 feet from the base station and anyone can wear it as a necklace or bracelet. It can also be upgraded to for automatic fall detection. Both the help button and the wall buttons are 100 percent waterproof due to the fact that bathroom-related accidents are so common. Additionally, the wall button has a 50-year battery life and is ultra durable. Best of all, the In-Home package comes with FREE monitoring for your spouse if you purchase a second pendant! Bay Alarm's GPS Alert System is a small, lightweight device that offers GPS location as well as the all-important caregiver tracking. This compact gadget is not just for seniors. If you're a parent and worry about your children taking the bus every day, whether or not they are arriving home safe from school, the GPS Alert System offers peace of mind with 24/7 professional assistance at the push of a button. It comes standard with GPS monitoring and tracking, multilingual support, and can last up to 72 hours on a single charge. The GPS tracker also includes several FREE accessories, including a necklace style lanyard, charging pod, as well as a case with belt clip. Moreover, Bay Alarm's GPS Alert System can be upgraded for auto fall detection. For those interested in professional monitoring as well as tracking, why not bundle the In-Home System with the GPS Alert System. With this, you not only get the best of both worlds - but you will also save! Similarly, this package can also be upgraded to include caregiver tracking, automatic fall detection as well as the in-home cellular unit designed for residents without a landline phone jack. 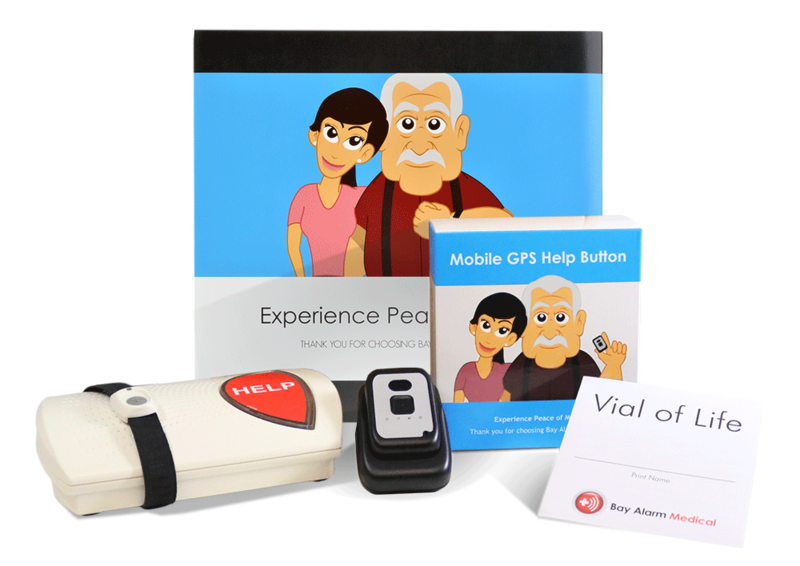 If you have an active senior parent or grandparent that needs mobile protection, Bay Alarm Medical offers a Mobile GPS Help Button that can be worn at home and wherever they go. It can be worn as a necklace or carried in a sleek case on a belt loop. However, the mobile GPS button is not waterproof, which necessitates the need for the in-home system if you want coverage for in areas like the bathroom. If you or a loved one happens to fall and end up unconscious, Bay Alarm Medical offers an automatic fall detection upgrade for both the in-home and the mobile GPS systems. This will trigger the device to call the 24/7 help center and initiate any medical services that may be needed. Bay Alarm has a number of benefits that put them ahead of their competitors. For example, there is no long-term contract and monthly fees are reasonable. They have multiple options available and they have three separate call centers to ensure 24/7 coverage should one call center becomes inoperable. They also offer a 30-day trial of the service and should you cancel the service early, they offer a pro-rated refund for the months that you have paid for but not used. The company also offers another huge benefit with all of its systems. Bay Alarm Medical sends a free Vial of Life kit so that you or your loved one can fill in their medical history including medications so that EMTs and other medical personnel have all the information they need to do their jobs. There are few cons to the Bay Alarm Medical's system. Number one is that their GPS help button is not waterproof. Another con is their use of AT&T Cellular. While this can be a great feature in most cities, if you live somewhere rural that isn’t covered by AT&T and you don’t have a landline service, you can’t use their system. Granted, this isn’t a major disadvantage, but it is something to consider if your loved ones live in a rural area. If you’re looking for a reliable medical alert system for your parents, grandparents, or even to monitor your children, Bay Alarm Medical has the experience and reliability you need. They have several products available and their price is very affordable. Compared to other systems, Bay Alarm is a basic system that has everything you need and does what it advertises – keeps your loved ones safe.